In my “Best & Worst in Gaming 2009” posts, I picked the Alpha Omega RPG game line for “Best Production Values”. If you want your non-gamer friends get interested in the hobby just put one of the Alpha Omega books on your table and they’ll start leafing through it, admiring the beautiful artwork. When I recently showed my gaming group “Alpha Omega – The Encountered Vol. 1” I was immediately asked when I’ll run this game. I don’t think you can’t have a better first impression than that! I also want to thank Mindstorm Labs again for providing me with a review copy. Thanks again, guys! “The Encountered Vol. 1” is a compendium of about 200 creatures for use with the Alpha Omega RPG. It also contains details on seven factions like the Legions or the Technocratic Coalition, fully detailed with history, agenda etc. and even creature creation rules. But the major part of the book is definitely the creature compendium which is divided into five sections: Freaks of Nature, Tech Fiends, Spiritual Creatures, Abominations and Demons. As you can see in the photos above, the horizontal format really works well for a monster book. A great plus in my book is the fact that every single creature comes with an illustration. If you ask me it’s much easier just to show the players what they characters encountered in the wilderness instead of describing it. This may take some creative control away from the GM, but when the artwork is as beautiful as AO’s I don’t really mind. The creatures themselves are a bit of a mixed bag. Don’t get me wrong, some of the creatures are very cool and get me even more excited to run the game, but others are just a bit too weird or are just plain silly. There are the Squicks for example, which basically look like dirty, wild halflings who live on garbage dumps, sewers or abandoned arcology levels. If you ask me, the person who designed that creature wasn’t very fond of Hobbits/halflings and so he added the Squicks to the game. Even their name comes from the sound their heads make when hit by a bullet. Ouch! But aside from a few blunders the majority of the creatures is weird in a good way. The only thing that’s sorely missing from the book are a few mundane animals. Sometimes a few wild dogs can be more effective than some fantastic creature. The seven Factions described in the book add some more flavor to the world of Alpha Omega and might help the GM to come up with interesting adventures but lack the depth I hoped for. One page per faction is just too short. But I am sure Mindstorm Labs will expand on that in the future. The creature creation chapter called “Creature Discovery” in the book gives GMs some guidelines on how you create custom monsters for their games. I haven’t tried to create a creature yet, but from what I’ve read the process is pretty easy and straightforward. After coming up with a concept you follow the step-by-step instructions given in the book to turn your idea into game stats. 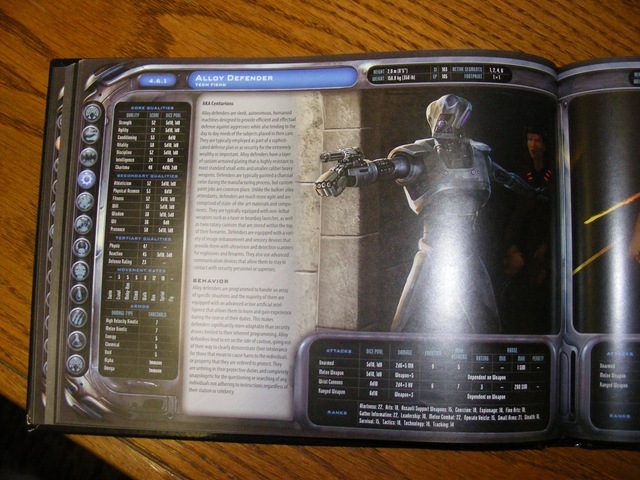 The chapter “Encounter Management” contains detailed information on how to balance encounters. Especially when you are new to a game it’s quite hard to create challenging but fun encounters. I can remember several occasions where I almost killed the complete party by mistake. This chapter provides the GM with some tables and advice that should allow him to scale the encounters with ease. 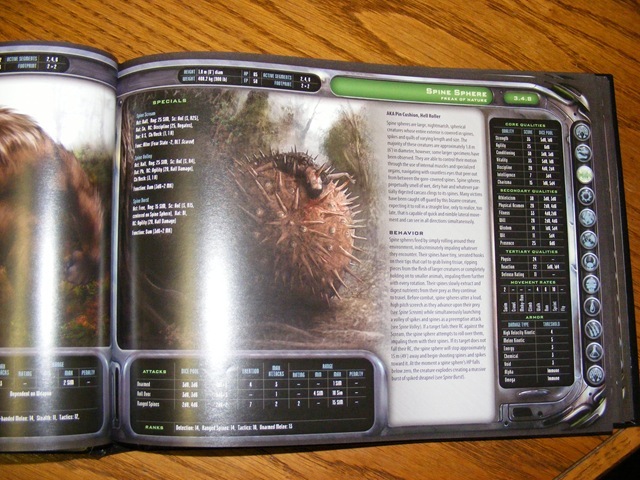 Last but not least the book contains a large number of templates that help GMs to quickly customize creatures. You want to make sure the aforementioned Squicks are even more repulsive, add the Slimy template. Or you want to give that robotic menace you created for your last adventure some more firepower, add the Armor Piercing template. Especially if you don’t want to create your own creatures from scratch, the template system can help to tweak things to suit your needs as a GM better. The book is concluded by an appendix containing a glossary, index and empty creature sheets for you to photocopy and fill out. Alpha Omega – The Encountered Volume 1 is probably one of the most intriguing monster compendiums I’ve ever seen. It’s brimming with creative ideas and gorgeous artwork – much like the Alpha Omega core rulebook – but it also has a few weak spots. Some of the monsters are a bit too weird for my taste or just plain silly. The factions could have been fleshed out a bit more, it almost seems as if they had been added as an afterthought. The rules for creature creation are a nice addition and seem easy enough to use. The template system is not a new idea, but it does its job perfectly. If you ask me, The Encountered Volume 1 is the perfect addition to the Alpha Omega core rules, especially when you want the player characters to leave the sheltered life of the arcologies or walled cities and travel to the untamed wilderness of the Alpha Omega world. I'm glad the beasiery matches upto the high standards mindstorm have set themselves! I look forward to getting my own copy, Many thanks for excellent review! .-= misterecho´s last blog ..You have more power than your Government! =-.